Our flight to Bermuda flew direct from Gatwick airport and gave us plenty of legroom, good meal and snack service and attentive stewards and stewardesses. There was also a very good selection of in-flight entertainment. The outbound flight took just over 7 hours, whilst the return was slightly shorter at six and a half. Overall, the accommodation we got to take a look at was very impressive. There is such a variety of resorts in Bermuda so everybody should be able to find somewhere that suits their needs and budget. All of the hotels are split into three categories; World Class, International and Bermudian owned and regardless of where you stay, you are never more than 10 minutes away from a beach. The scenery is beautiful; very lush and green with a backdrop of pretty pastel coloured houses with white limestone roofs. Although we only stayed at Elbow beach, we visited nearly all the hotels on the island and so we got a good idea of what there is to offer. Elbow Beach is run by Mandarin Oriental and I felt the standards were very high. There are 98 luxurious, spacious rooms and suites throughout 50 acres of lush garden and these offer an exclusive and intimate beachside escape. There is a large swimming pool, a gym and an excellent spa. All the restaurants overlook the beach and, like many other hotels in Bermuda, if you book the half board option you can dine at several restaurants in the capital of Hamilton. The restaurants are also run by Mandarin Oriental and are again at of a very high standard. The cost for half board would be approximately $72 per person per night. Grotto Bay is the only all-inclusive hotel on Bermuda. It is very close to the airport, but there are not too many flights in and out so noise is not really a problem. The staff were very friendly and welcoming and the hotel has a very relaxed and informal feel whilst being set in 21 acres. The all-inclusive package is £62 per person, per day and includes all premium brands of alcohol, non-motorised water sports, bus and ferry passes. The hotel had a great atmosphere and the rooms were a little dated but very clean. This would be a good option for somebody on a bit of a budget or a family who want great value for money. There were also two natural caves in the grounds, which was quite unique; one used as an indoor pool and the other one for spa treatments. It was great to see a natural resource used in this way. The Reefs, located next door to the Southampton Princess, was my favourite hotel. We had an excellent dinner here and the hotel is run by a father and son, with the son’s wife arranging all the weddings. The hotel has been in the family for 40 years so you do get a very personal service. It boasts a stunning setting with breath-taking ocean views from all the rooms, suites or condos. There is an award-winning spa and three acclaimed restaurants on the property; you can have an intimate beachfront meal at Coconuts, go to Royston’s for a steak, or you can choose to dine at Ocean Echo. All the room types we looked at were decorated to a very high standard in Bermudian style; it had a contemporary feel to it. The Rosedon Hotel in Hamilton was also a firm favourite of mine and is an old colonial house that has been converted into a hotel. The brochures show the beautiful frontage with a terrace where afternoon tea is served every day at 4pm and behind the main building, there is a swimming pool surrounded by palm trees with several poolside rooms available. The same staff have been at the property for years; the manager, Muriel, thinks nothing of making the scones for afternoon tea as hers are the best, whilst the receptionist might be the one making the cookies. There is an honesty bar in one of the lounges so you just pop your dollars in a jar and help yourself to drinks. The rooms were beautifully decorated with a lot of attention to detail; the mattresses on the beds are so thick and some of the four-poster beds are so high that they have a little wooden step to help you up. Features of the hotel include wireless Internet, guest computer and breakfast delivered to your room, porch or pool patio. There’s also a free taxi to Elbow Beach twice a day. The excursions that we got to take part in included: a guided tour of the crystal caves, a look around Gibb’s Lighthouse (one of the world’s few remaining cast iron lighthouses), a visit to the aquarium, dinner at the Hog Penny restaurant, free time in Hamilton for shopping and the chance to look around the historical town of St George, which is the old capital. We also got to see the Royal Naval Dockyard, which is Bermuda’s premier tourist attraction. 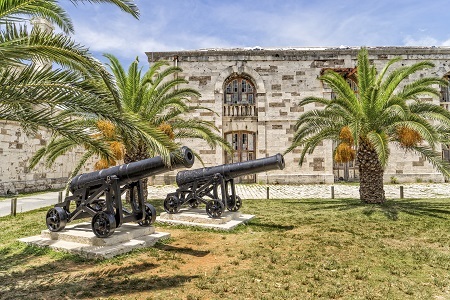 Restored historical buildings, surrounded by crystal clear waters at the Western tip of the island, create a spectacular backdrop to everything from great food to shopping, water sports, museums, working arts and crafts studios and even the chance to swim with dolphins. The whole trip was fantastic, but if I had to choose one highlight I would say the time we spent on Elbow Beach, where I was lucky enough to be staying. The beaches are the best I have ever seen; the consistency of the sand was like talcum powder and it had a soft, pinky hue due to the coral. The sea is the also most amazing turquoise colour and crystal clear; perfect for snorkelling and diving. We had lovely weather every day, with warm temperatures and only one day of rain. The main season is May to October and it can be a lot milder if you are planning to go outside of this time. The hotels were only 50% full so consequently the beaches were deserted. We saw a wedding on the beach and we were the only people on the sand beside the guests. I can’t think of anything. We were hosted by BA and we were told there may well be ‘two for one’ flight deals being implemented at some point in the future. If anyone wants to visit the Caribbean, I would definitely suggest Bermuda as an alternative option, as the flight is much shorter. It also feels more upmarket than the Caribbean and there are no shanty towns or rundown areas. There was also nobody hassling you to buy things whilst you are trying to relax on the beach. The Bermudian people are so friendly and really seemed to appreciate the British tourist, as a large percent of visitors to the island are American (the nearest land to Bermuda is North Carolina 670 miles away). 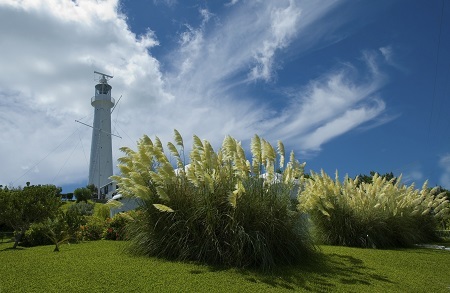 As Bermuda is still a British colony, it has retained a very British feel. For example, most hotels still serve afternoon tea as part of the package. 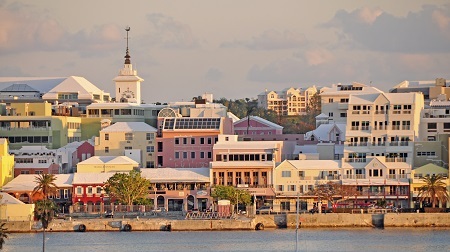 Bermuda would be a great destination to include with a trip to New York, Boston or Toronto, as the flights between these cities and the island are a little over 2 hours. Taxis are very efficient and reasonable, which is handy as tourists cannot hire cars on Bermuda. This is possibly a good thing though as all of the roads resemble country lanes and the speed limit is only 25 miles per hour. I think it is definitely best to leave the driving to the locals who know the roads really well. Bermuda is by far one of the most beautiful places I have ever visited; the people are all genuinely happy and extremely welcoming. There are numerous stunning golf courses (more per square mile than anywhere else in the world), which is amazing as the island is only 21 and a half miles long and one and a half miles wide. There are a number of walks along the old railway lines and these range from one to three hours in duration. Bike hire is also available and very safe as there are dedicated cycle tracks. If you are looking to enjoy some winter sun in this part of the world then we can help you plan your holiday to Bermuda in style. Our travel agents in Colchester, Norwich, Felixstowe and other locations within East Anglia and along the south coast can offer their expert advice and find you a great deal. For a full list of our store locations, visit the shops page.